To pour all the flour. With so much more fun!" The house with bloody holly. To shine with green and red. He needed now to think. That is on hedgehog’s list. Because he loves the dark. He ended up like others. And fastened them with rope. And carried on his plan. In first floor living room. And saw the pretty scene. Because he like it there. Because his flies are sleeping. On top of Christmas tree. 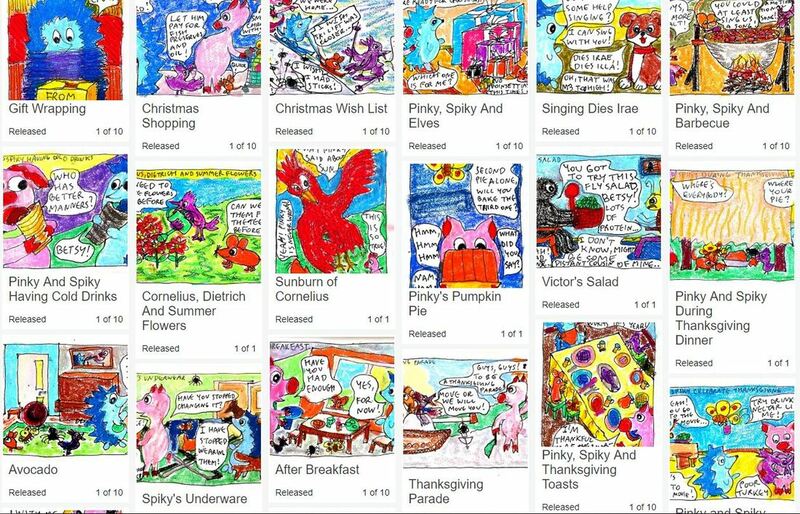 I was looking for a long time to make my comics available as rare digital art. And at the end of November I came across Makers Place, a platform based on San Francisco which is the easiest way to create and sell unique digital creations using blockchain technology. ​Some of my friends on Steem blockchain are there too (@donnadavisart, @joechiappetta for example). Specified how many editions my artwork will have. After a few moments I put it on sale in their marketplace by specifying the price in ETH. Ryoma Ito from Makers Place was very helpful in my first few weeks there. At one time I couldn't login to the website from my laptop and I thought I forgot my password. So I sent her an email and she investigated and said that I was trying to login to the wrong domain name. I double-checked and sure enough my mistake was to use .co ending instead of .com. I wouldn't know the difference if not for Ryoma's help. So it appears if an artist gets stuck for some reason, help is just an email away. I'm new in this rare digital art space so don't know what to expect yet. But it's a thrilling feeling to know that within 5 or 10 years something like that will be a very normal way to sell and collect art. I'm one of the pioneers and you can be too! And was at a loss. He grabbed some holly with his little paws. And flew over to check. "She is one already for living with you!" And now I'm a saint too!" 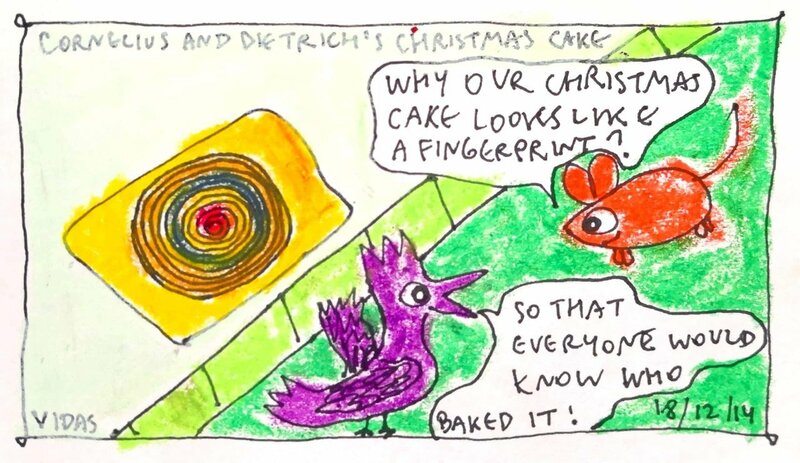 A Christmas cake for them. Didn't know where to start. Dietrich said, "we must first watch the movie"
"Just one match", they said. They again played the match. Pull up by the door. "Quick, let's make something before they come in!" And Spiky yelled, "we're home!" "This cake is for you!" Like a castle on the beach?" Who doesn't want Christmas presents? Before the mystery of opening the box? Wrapped all the gifts for everybody. Most love to give for the gang. So that she could drive him safely to church. Could walk to the store in the snow and get him worm chips. In the hope of getting a glass for himself. So that he could borrow it from her and shoot some bears in the rear. So that he could borrow it from him and read it to Pinky. Then he went to look for wrapping paper. Where Victor weaves all his cobwebs. With some purple ribbon that needed curling. And started to curl the ribbon. Which began to curl and curl like some wild rattle-snake. Which now looked like a happy Chinese dragon. That his heart rate rose to the heights of running a race. Couldn't move his feet nor his paws. I won't leave Pinky upset during Christmas. That's why I myself will be the present to her." What to put on the Christmas table. And half of the carrot to boil the stew. Along with the sweet apple juice. We go for a fun Christmas shopping. And was ready to go to the store. To encourage everyone to buy generously. That everyone loves so much. Until it is ready to form a cake. That taste so well on the Christmas Eve. And is healthy for everyone's plumbing. Fruits, veggies, macaroni and cheese. If his plastic card would have enough Steem. So eagerly picked for their Christmas feast. 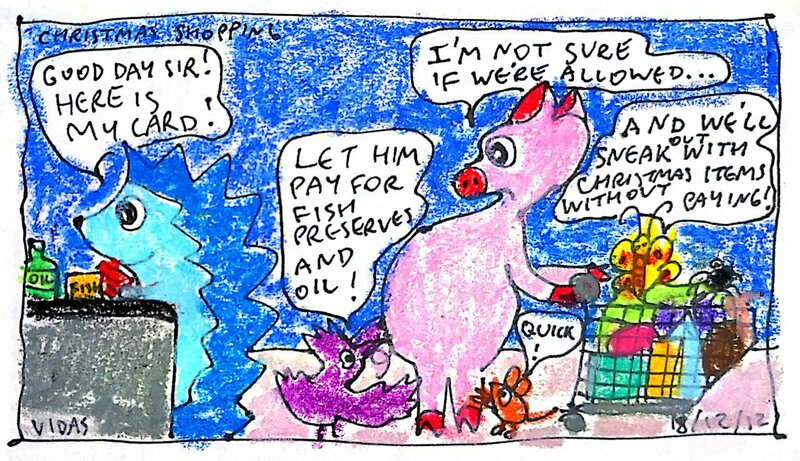 "Let him pay for fish preserves and oil"
"And we'll sneak out with Christmas items without paying!" "I'm not sure if we're allowed." "It's the new Christmas tradition to get everything for free." Decided to step in and save the dignity of the family. 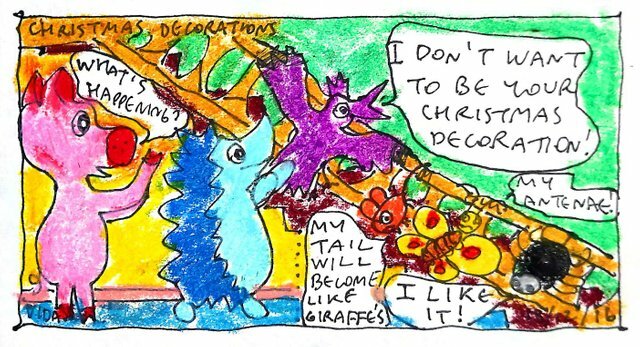 "Spiky, look what your pets are doing. That stealing is OK at Christmas." "It's OK, no need to sneak out like thieves." "We can gladly pay with my Steem plastic card. Wishing for a higher hill! 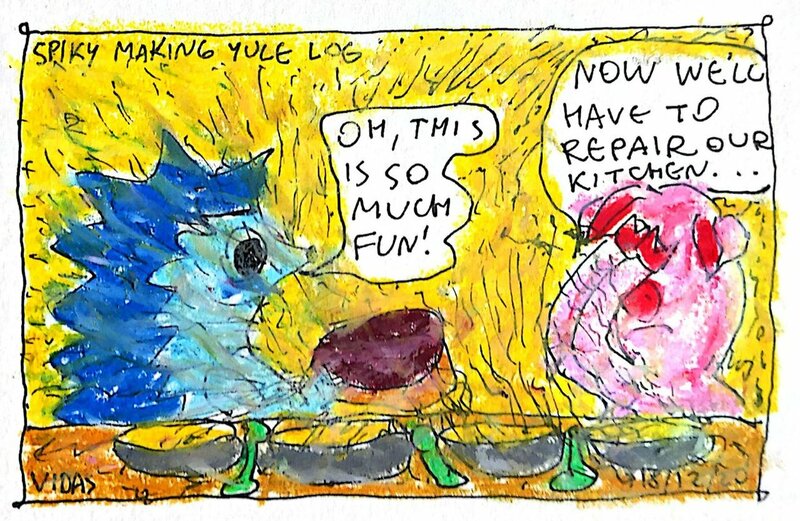 On one snowy December morning Pinky, Spiky and the gang ate heavy breakfast because they had leftovers from the party the night before. After everyone was so full that they couldn't possibly eat more Victor asked, "What shall we do today?" 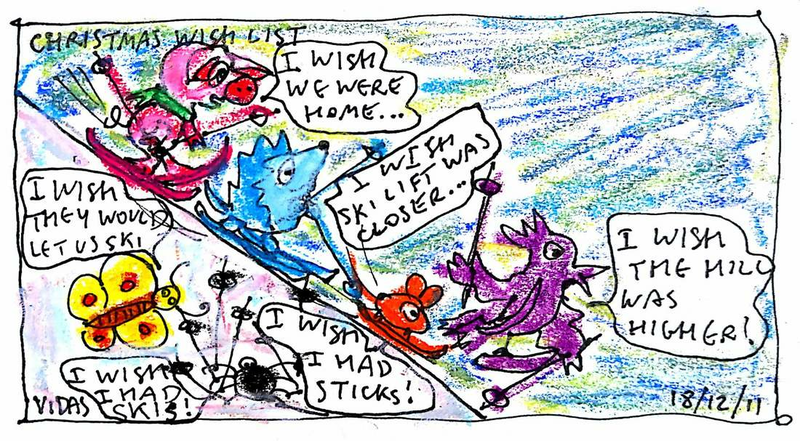 Pinky wanted to have a quiet relaxation time, Betsy wanted to go look for a boyfriend and Cornelius wanted to go skiing in the hills across the forest. Everyone took a vote and since the majority didn't want to go look for Betsy's boyfriend or just sit quietly in the house solving Sudoku puzzles being not as good with numbers as Pinky, they decided to go skiing. Victor went to the cellar and found old skis for everyone but Betsy. She wasn't inclined to join them. But since no one was volunteering to babysit her, the gang decided to go outside together. Dietrich went to the cellar and took skiing sticks to go with their skis. Pinky made a thermos of hot tea for everyone in case they would get cold. And Spiky... he just sang motivational songs. When they were ready to go outside, they put some grease on the skis and tried to ski. It wasn't as easy as they hoped. Everyone but Cornelius was struggling. Since he had his wings, his skiing skills seemed quite virtuoso. When they reached the hills, the gang was a bit cold so Pinky offered them hot tea from the thermos... Dietrich made a fuss that the tea is too hot and Victor was very anxious to get to the hill. So anyway, since the closest lift was about kilometer away, they all went slowly up the hill. Pinky fell down several times on her nose since piglets aren't natural skiers. Spiky also fell once but since he had sharp spikes, he didn't roll downwards but stuck in the snow. Little by little they all reached the top of the hill and looked down. The world seemed very small beneath their feet and Pinky was worried how they all are going to ski safely from such heights... Betsy and Victor went a little bit downwards to observe the skiers approaching from the top. Pinky gave them the bag with the thermos to keep safely. Betsy seeing this changed her mind about skiing. She also wished she could join them and forgot about her non-existing boyfriend. Victor was jealous of everybody who had skis so he wildly moved his sticks in the air. They waited for Betsy and Victor to join the gang and took a vote what to do next. 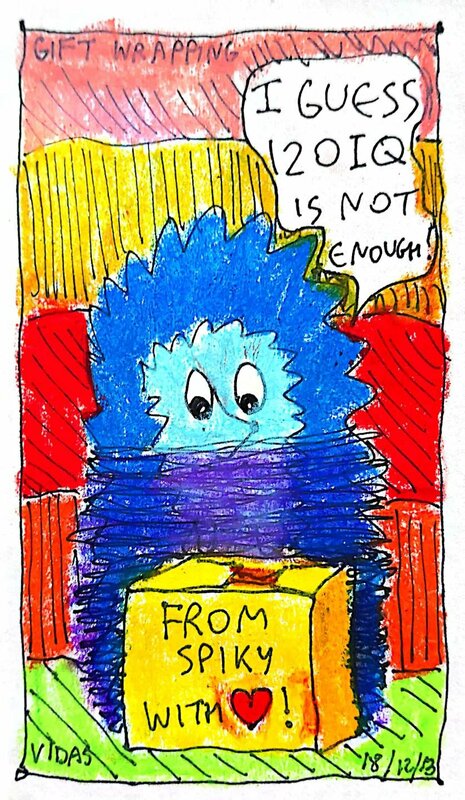 This comic is a continuation of my wife's @laputis drawing from yesterday. 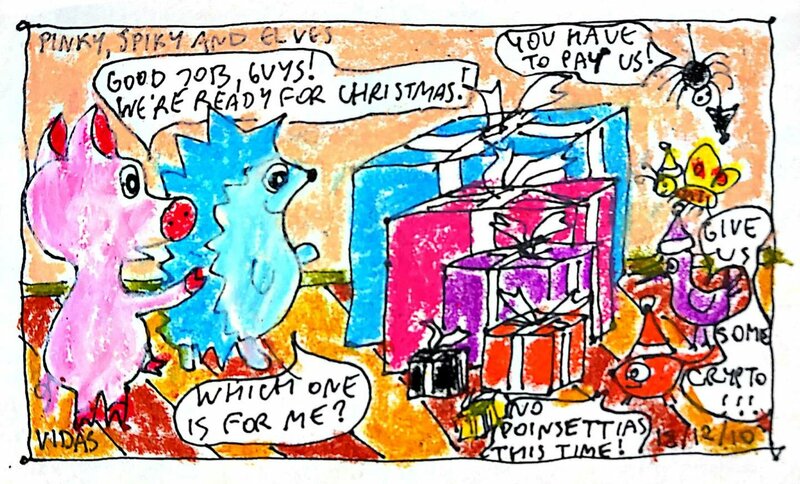 It was "Elves" theme for Artstorm contest and she drew how Cornelius, Dietrich, Betsy and Victor are packing the presents for Pinky and Spiky. Cheep child labor! I hope this silliness will put a smile on your face! You are singing a minor 3rd too high! 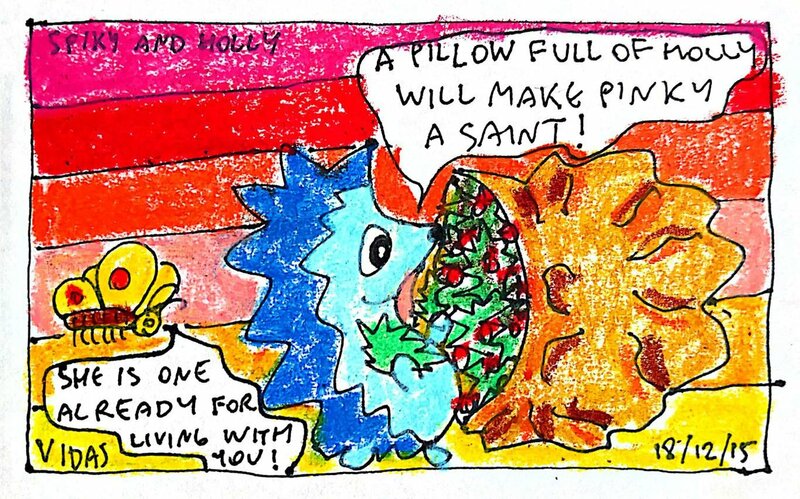 I few days ago I was invited to give a presentation about my Pinky and Spiky comics at Vilnius University Evening of Languages. My talk was about language, comics and humor. 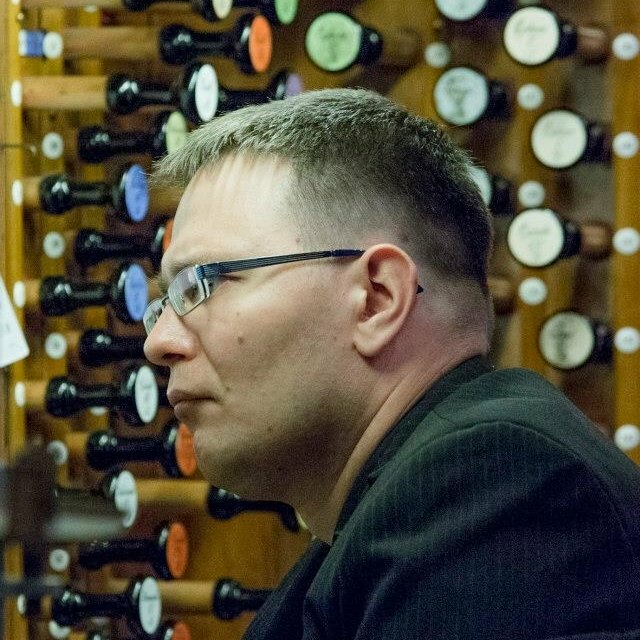 When I came into the hall before the event, I saw my friend Ignas who is a choirmaster for University choir "Gaudeamus". I asked what is he doing here and he said he is going to sing with the students a specially composed anthem and later "Dies Irae". This is Gregorian chant sequence specifically sung at All Saints Day. He actually sang very beautifully when it came his turn to do "Dies Irae." Only not from F but from Ab. which is a minor third higher. After the event I thought it would be nice to create a comic about it so I wrote him what is his favorite animal. I didn't hear his reply until yesterday and he wrote that it's a dog. He actually send me a little sticker. I used this sticker as a model for this comic. Spiky asks the dog, "Do you need some help singing? I can sing with you!" 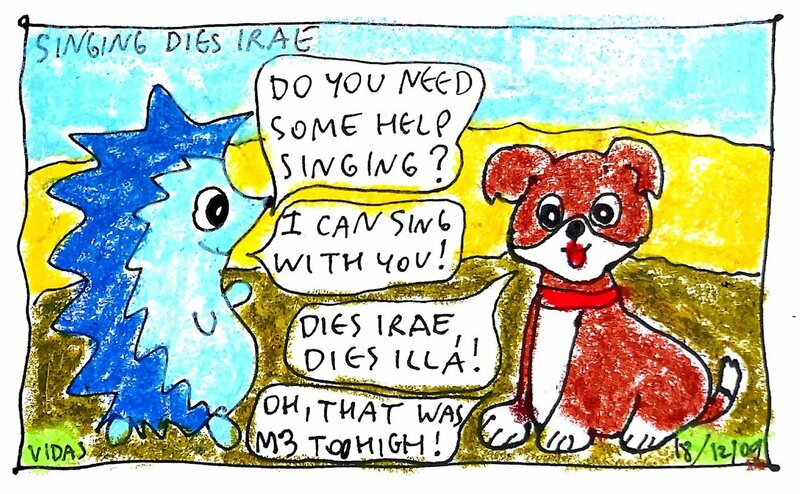 And the dog starts to sing, "Dies irae, dies illa!" to which Spiky replies, "Oh ,that was a minor 3rd too high!" When I sent this comic to my friend Ignas he asked me what's the name of the dog. I thought it could be somewhat connected with his last name, Garla so I wrote, "Garly." He seemed pleased.